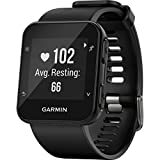 If you’re looking for a solid smartwatch that works with either the iPhone or any Android phone, the Garmin Forerunner 35 Watch is a great option that you might not have considered. It offers great features in addition to notifications such as 24/7 heart rate monitoring, which is something you don’t see on rival watches. This model also offers more than a week of battery life on a single charge, and that’s just awesome. Amazon’s deal of the day on Friday slashes the price of certified refurbished models to just $112, which is a crazy deal. That price is only food for one day though, so grab one while you can. Vibration alerts – helpful vibration alerts notify you of running prompts, activity tracking milestones, smart notifications and virtual pacing progress. Updated display – new high resolution display that is perfect for indoor/outdoor viewing. Smart connectivity – auto uploads, smart notifications, live track, music controls and automatic sw updates.